A brilliant Christmas gift idea with a personal touch for any Mr and Mrs, whether just starting out on married life, or well established! 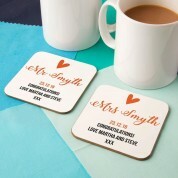 They will be proud to show off the classy design and personal touch when entertaining guests in the home. 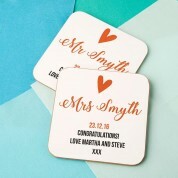 The simple design on our double coaster set show a cute love heart in bright red. Below reads “ Mr” and “Mrs”, along with their surname and a special date. (This can be a wedding or anniversary date). 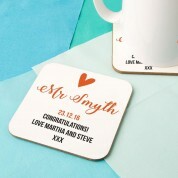 We even include space for a short with love message of choice, making it truly unique to the couple. It will make them smile every time they read it and the simple design will add a touch of class to any table top! They will love such a useful gift with such a timeless design.